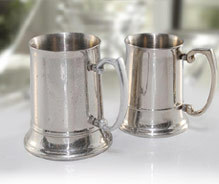 We design and manufacture an extensive variety of stainless steel pewter tankard,antique tankard and antique pewter tankard impeccably crafted with superior finish. Artistic design and eye popping look of these tankards allure the heart of drinkers at first glance. Besides it, we also offer stainless steel drinking vessels, stainless steel drinking cup, stainless steel wine goblet, antique tankard, antique pewter tankard, pewter beer mugs, beer mugs, beer tankard and other stainless steel drinkware. The moist frothy water drops outside these pewter beer tankard say - look no beyond as it's beautiful aesthetic finish provide a perfect cavity to premix ice and beer that gives a refreshing feel in the smothering summers.